Mount Kilimanjaro is within the East African region in the country of Tanzania (East Africa’s largest country, 947, 303km2) and lies along coordinates 03004’33’’S and 37021’12’’E south of the equator. 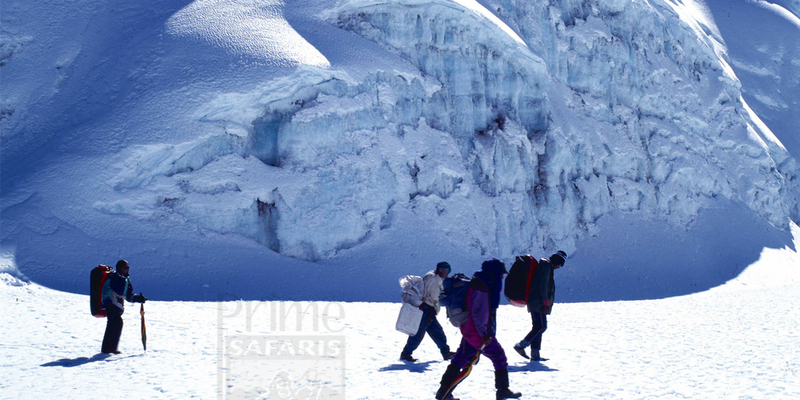 Being a national treasure, the mountain is in a protected area within Kilimanjaro National park. 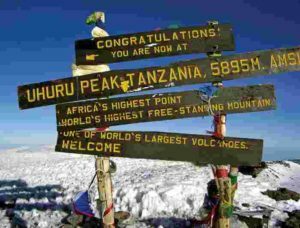 The mountain has three (3) distinct volcanic cones hiked by tourists on mountaineering safaris in Tanzania which are Kibo, Mawenzi and Shira. Kibo is the highest peak at 5,895m with Uhuru peak as the highest summit on Kibo’s crater rim, Mawenzi is 5,149m (16,893ft) and shira is 4,005m (13,140ft) with a broad plateau at 3,800m (12,500ft). Mawenzi and Shira peaks are extinct whereas Kibo is dormant and could probably erupt again, it’s the largest cone more than 15m (24km) wide. Mawenzi and kibo are separated at 4,400m (14,400ft) by a saddle plateau. The best time of the year for hiking Mount Kilimanjaro is during the dry months of January/-February or August-September when the mountain is not so much slippery. The park however, is open to hiking tours in Tanzania all year round. Whether first time or seasoned hikers, many therefore ask how to best get ready for a Mount Kilimanjaro hiking trip, and here is how. Just to warm up your muscles and get your heart rate up for the hike especially if you haven’t been active for a while, you should start with basic training. These trainings are inclusive but not limited to running or walking in sand, standing on a tennis ball, do squats and lunges, do push-ups, do step ups with your back packs as you add in 5 pounds each week till it’s as heavy as your back pack and you can make 700 steps in 30 minutes. These exercises will help you build the muscles that protect your knees and ankles. Two of the most common injuries on a hiking trip are ankle rolling and ankle sprains and with these exercises you can avoid them and return from your hiking safari in Tanzania safe. For a first timer trying out the adventure of a hiking trip, when the weather is good, you can opt for a day’s hike. However, before you push yourself harder, if you haven’t been active a lot you scan start with taking a walk two to three times a week while carrying a light day pack. On the day’s hike, wear the same shoes that you’ll be wearing during the hike (just to make sure you will be comfortable during the hike). You may wonder why but then. on a hiking trip you will definitely have to slope back down, but this isn’t just about sloping. Downhill hiking is tough on your legs, toes, and especially knees. During the downhill hike, your body is holding its own weight back, plus whatever you have in your backpack, to avoid falling. This repeated pressure can lead to injury yet rolling over rocks and uneven surfaces can also strain joints. While preparing for your hiking trip to Mount Elgon, hike downslope too, to ensure that you can do it right with your shoes and the back pack too. Whether you are an experienced hiker, your foot wear can be a determinant to your hiking adventure. Choose a hiking boot that will protect and support your feet and ankles because if it doesn’t you will want to get it off your feet before the hike ends. While buying your shoe choose one that is good for both hiking and makes your packing easy. Do your research early, fit in to the shoe and hike for a day with the shoe just to ensure you don’t have your hiking trip messed. Geographically it’s said the higher you go the cooler it becomes and with the energy invested on the hike, you can probably get sick since oxygen reduces towards the peak. The best way of beating altitude sickness is by giving yourself time to acclimate to the elevation by gradually climbing slowly. You can do this by spreading the number of days on have a long Tanzania safari. The other way is also by drinking plenty of water, eat a lot, keep your pace slow and in case it completely fails then go down to a lower altitude. It hurts to retreat from your hike but then your health is important as well. For simple headache always pack some medication after consulting a physician. Planning right for your safari can really be rewarding, with no order keep these tips in mind and any other personal tips thought possible. Many tourists on Tanzania wildlife safari tours would love to hike Mount Kilimanjaro but are scared of the height but this should not scare away hikers, Mount Elgon National Park in Uganda offers a great family hike to Mount Elgon peak at an altitude of 4,321 m above sea level. Tailoring in for a Uganda safari can easily be planned and connected by chartered flight.